Substances have different tendencies to donate or accept electrons. When a really good donor meets a great acceptor, the chemical reaction releases a lot of energy. Oxygen (O2) is the best electron acceptor and is used in many aerobic reactions (reactions with oxygen). Hydrogen gas (H2) is a good electron donor. A redox reaction is one in which all instances of oxidation and reduction happen in pairs. Notice that the reaction has to balance — the total number of atoms of hydrogen and oxygen on one side of the reaction are the same as the number in water on the other side. Balancing the redox reaction is crucial to all biochemical reactions in the cell and can create interesting challenges for microorganisms that live in anaerobic environments (environments without oxygen). Oxygen and hydrogen are at either end of the spectrum of electron acceptors and donors, but there are many substances in between than can readily accept electrons in one situation and donate them in another. Cells need a lot of primary electron donors and final electron acceptors on hand for the number of chemical reactions going on all the time. In reality, there aren’t always unlimited amounts of electron donors and electron acceptors around. And this is where electron carriers come in. These convenient little molecules go about accepting electrons and protons (H+), which they then donate to another reaction. 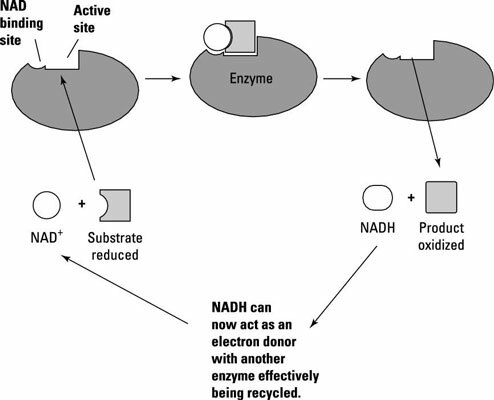 The figure shows NAD+/NADH, which is an electron carrier that is reduced (to NADH) in one reaction after which it is oxidized (to NAD+) in another reaction. Electron carriers like this one help increase the productivity of the cell by linking incompatible redox donors and acceptors; because they’re recycled over and over, the cell only needs a small amount of each one.